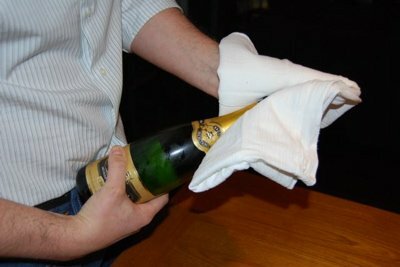 Use this method the next time you want to share a bottle of Champagne with a date. The first thing to do is remove the packaging foil around the neck of the bottle. There should be a small tab to get you started. Next, untwist the wire around the cork and remove it. Here is a quick safety tip – make sure the bottle is not pointed toward anyone or anything breakable when you go to open it. Grip the neck of the bottle firmly in one hand and the cork in the other. Using slow but firm motions, gently twist the cork up and out of the bottle. You should hear a satisfying pop, but there will be no dangerous explosion. All that is left to do now is pour your Champagne into a couple of flutes and enjoy. Doomsday 2012: How will it all end on Friday, if Mayan prophecy is true?